Courtesy of a link I saw on Twitter recently, here's a beautiful batch of thirty five paper flower tutorials as compiled by TipNut... Are you looking forward to warmer weather like I am? We could be forcing (paper) buds while we wait! 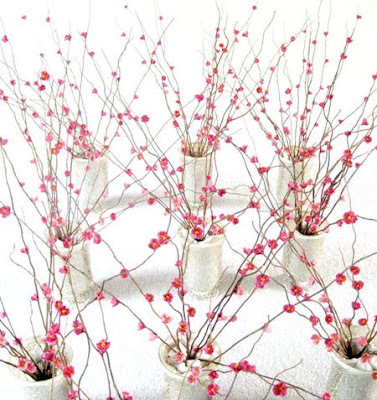 And while we're thinking spring and talking paper flower ideas, perhaps you remember a previous post about Benagami. Ben Coleman has been creating incredible origami bonsai sculptures from recycled paper for the past several years. 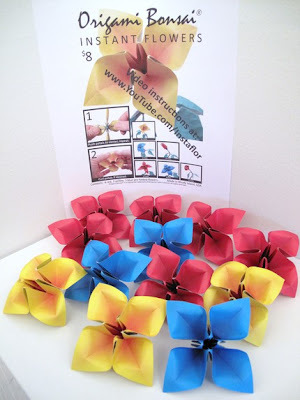 The newest item in his collection, just released this month, is a packet of Instant Origami Flowers. These are pre-folded origami shapes that reveal a colorful flower with two simple movements. Instructions are on the package and also on YouTube. By making additional folds, it's possible to create more intricate flowers like zinnias and lady slippers. Truth be told, origami diagrams have been known to make my head swim, but with the video as a guide, I was able to master the "long bud" model that Ben classifies as a difficult fold... so don't be scared off! Use Instant Flowers as party favors, place card holders, to create arrangements, embellish springtime wreaths, adorn gifts, slip into get well cards, or add a few to an Easter basket. As a former math teacher, Ben offers lesson plans using the flowers for grades 3-8 and high school trig students. 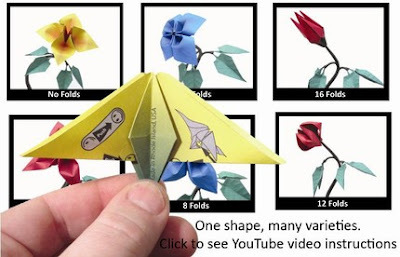 What a great way to get kids interested in math and origami! He will also imprint the flowers with corporate logos and campaign slogans as eco-friendly, growth-oriented promotions. Reach Ben via his website, Benagami.com or visit his Etsy shop. Oh my goodness, those are amazing. What a very clever idea! Oh, how I wish my math teachers had taught me to love math through learning origami! What a brilliant teacher! Thanks Ann! I love the TipNut tutorials, Ann - thanks for sharing! Those are so cool. I usually get a little confused when watching the origami videos. They seem to move so fast. I usually have to watch a few times before I get it right. My day is not complete without visiting your blog. 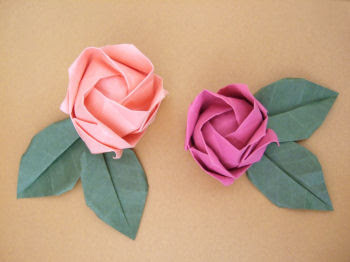 I love making paper flowers thanks for sharing.